The Olympic motto, "Citius-Altius-Fortius", translates to "Quicker-Higher-Stronger", and that may be, in a large part, the motivator behind our love of records. It's natural to want to know who was the best ever at a major event such as the Michigan High School Track & Field Finals. Sometimes, though, figuring out who the best are is a complicated process. A committee assembled in the early spring to settle on the fairest approach to the challenge. Comprised of Jeff Hollobaugh (Ann Arbor), Jim Moyes (Muskegon), Ron Pesch (Muskegon), Kim Spalsbury (Grand Ledge), Rich Tompkins (Fremont) and Bill Wehrwein (Chelsea), the committee took a look at each state meet record for the Lower Peninsula Finals with an eye toward rectifying some errors and creating a fair slate of records for the athletes of tomorrow to aim for. METRICS VS. IMPERIAL DISTANCES: From the beginning of the State Finals until the 1980s, races were run at the traditional imperial distances: 100 yards, 220y, 440y, and so on. The switch to metrics brought a new slate of records, but not without controversy. The problem was that many of the "old" records were simply faster than the new records. In the 100, that wasn't such a problem, since the 100-yard dash is significantly shorter than its replacement, the 100 meters. However, from the 200 through the 3200, the old equivalents are longer than their replacements, by 0.58%. That may not seem like a big number, but it translates to nearly four feet for a half lap, or 61 feet for eight laps. In the most classic case, Steve Elliott of Pontiac Central held the Class A mile record at 4:08.2. When the change to metrics came, the record went to Earl Jones of Taylor Center and his 4:18.1. This despite the fact that Elliott ran 10 seconds faster and 30 feet farther! 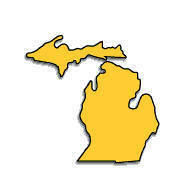 The committee felt it fairest that the MHSAA adopt the record-keeping policy that all the other major track & field associations use: that the record goes to the competitor with the fastest time, and that no one be penalized for running farther than the record distance. Old imperial records that are faster than the metric bests will be carried as the official record. However, record marks cannot be converted, since a record cannot be given for a time that was not taken. Therefore, though Elliott's time may convert to a 4:06.8 or so, the record remains 4:08.2. When someone runs 4:08.1 or better, the record will change hands. Out of fairness to Elliott and others in his situation, as long as his mark is still "superior" to the record, it will be kept on the books as a Notable Performance. HAND-TIMING VS. FULLY AUTOMATIC TIMING: This is a thorny issue, since the state meets before the 1980s did not have the advantage of fully automatic timing (FAT). FAT means that the clock is started by the gun and stopped by a photo at the finish. The resulting time is accurate. A hand-time, however, is either started or stopped (or both) by a human hand. Hand-times are inaccurate, usually by an average of two or three tenths of a second. The bottom line is that when athlete A has run 10.0 (hand) and athlete B has run 10.00 (FAT), we can say with complete confidence that athlete B ran faster. Athlete A's actual time was probably anywhere from 10.10 to 10.40, but we'll never know for sure. For the 100, 200, 400, 100H, 110H, 300H and 4 x 100 Relay, we stayed with the generally accepted conversion of 0.24 seconds. That is, a hand time was not kept as the record in one of these events unless it was a least 0.24 seconds faster than the best FAT time on record. Note that the National Federation no longer accepts hand-timed results for national high school records in any event. WINDY VS. LEGAL: Another tough issue to sort out. In the 100, 200, 100H, 110H and long jump, athletes can be significantly aided by a strong wind at their backs. In the 1930s, the sport worldwide adopted a standard of 2.0 meters per second (4.473 miles per hour) as the maximum legal wind limit for record purposes. Unfortunately, many of our state finals have not had working wind gauges, and statisticians have had to rely on eye-witness accounts and guesswork to decide what was windy and what was legal. While admittedly the committee could not resolve every problem here, it did recommend rejecting as records several performances in recent years that were widely acknowledged to have been aided by winds far above the allowable limit. Other problems were rectified as well. Over the years, with the final meets moving from site to site, some acceptable records fell through the cracks and never were given the recognition they earned (Gwen Wentland's 5-10 Class A record in the high jump, for instance). Records set in heats were sometimes not recognized, even though the rule book says that they should. Records reported as FAT times sometimes turned out to be misreported hand-times, and so on. Not everyone will agree with the new slate of records for the Lower Peninsula State Finals, but the members of the committee were strongly motivated by a very defensible philosophy: records must be absolute, and they must be fair. A bad record robs at least three competitors: the one in the past whose old record is erased; the one in the future who may break the legitimate record but not be given recognition because a better, but invalid, mark is on the books; finally, the athlete who is given credit for an invalid record is perhaps cheated the most--he or she is the one who has to live up to a false standard. Our scholastic track & field athletes are doing their absolute best in these state finals. It is up to us to do our absolute best to ensure that their efforts are recorded professionally and in full accordance with the rules.